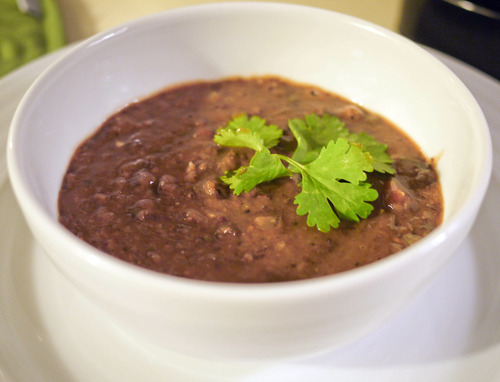 I found this recipe on Epicurious and then added my own spin to create this delicious black bean soup. It may not look like much, but the flavors were spot on. I doubled the recipe so I could continue to enjoy it for lunch the next day, and then coupled it with cheddar cornbread muffins. I sautéed the onion and garlic for a few minutes in Extra Virgin Olive Oil before throwing them into the soup. This was REALLY good. I had it. Epicurious is amazing! If you haven't already, you should check out www.foodgawker.com -- they have tons of recipes from different food blogs. Thanks Katie. I'll check it out - I'm always on the look out for new recipes. 1. Is this a picture of your actual soup? 2. Would Loose Meat be a good addition to this recipe? 1. Yes this is a picture of the actual soup we ate. 2. You really need to experience loose meat on its own before you start throwing it into recipes.